This really happened. It’s important for me to remember that. It’s been a rough stretch in our little household. Though the last few days have been (relatively) calmer, this recent period has been marked by wild emotional swings, arguments too many to count, and yelling and fighting in abundance. Ryan is defiant, seemingly over every little thing. Even events that ultimately turn out fine — giving the neighbors a ride to school, running a simple errand — are preceded by what feels like hours days of negotiating and threats. It’s exhausting. It frays the nerves and leaves patience, the one thing that is needed most, in perilously short supply. It’s a combustible mix, and it has gone off — more than once — in recent weeks. It is during stretches such as this one that I lean on the online autism community. Hearing similar stories of frustration brings a measure of comfort that we are not alone in facing these challenges. But perhaps even more important, hearing tales of triumph from my peers in this community reminds me to relive some of our own red-letter days when I am in need of an emotional lift. If I can just ignore the chaos for a moment, the signs are all around. Ryan’s latest grade update arrived in the mail yesterday, and with it, a reminder that the same child for whom sometimes every molehill is a mountain continues to pull straight As. The other night, I was walking through the ice rink where I play in an adult hockey league after a late-night game. I left an ugly situation at bedtime when I went off to play in the game and burn off some frustration. As I was carrying my equipment bag out to the car, I stopped to look at the bulletin board for Ryan’s youth hockey league, which plays at the same rink. I noticed something new. 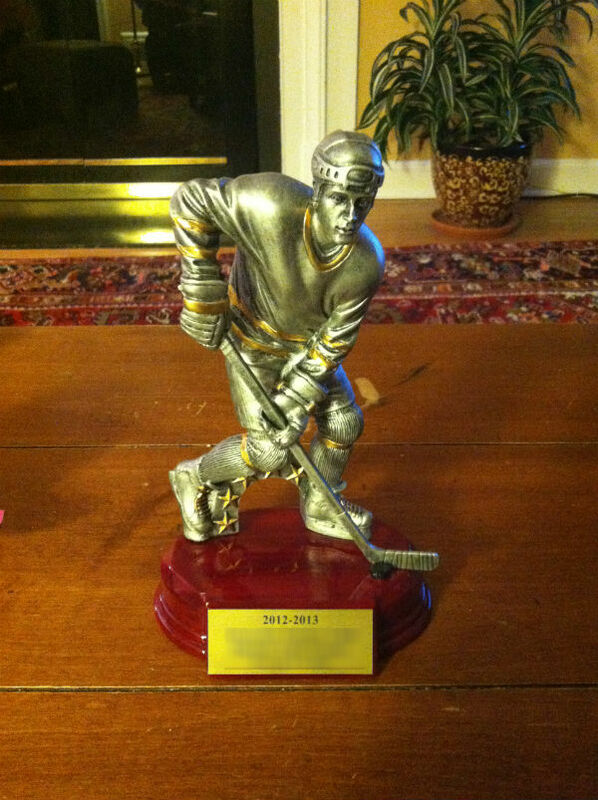 The list of the league trophies was updated recently, and Ryan’s name is now memorialized on the board after he won the most-improved player award in March. I stopped to stare at it for a moment, and as I did so a smile crossed my face. That day was at once so recent and so far away, but it is permanently etched in my memory bank. Days like that one don’t come around often. When they do, the memories they provide are worth their weight in pure gold. One such memory can undo many incidents of frustration and anger, because it serves as a reminder of what is possible. It was exactly what I needed this week. And to my friends in this community, whether it is seeing your child make it through a dance recital or celebrating a crush on a classmate, I hope you will cherish those special moments, because they will be the fuel that powers you through the difficult days around the corner. They certainly do that for me. All I needed was a little reminder. Thank you for the link back to my post! 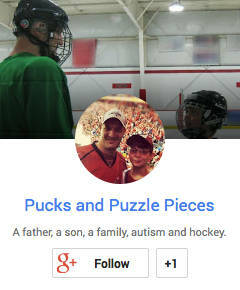 Sometimes the little things (and in this case, Ryan’s name added to the board of achievements-which is not so little) help us get through the rough patches. I hope things get a little easier at home. I know we are still struggling here with the transition to summer looming large. Wondering if summer transition is somewhat to blame here as well. Ryan will be switching schools — again — for next year and we’ve (well, Veronica has) been doing summer camp planning and all that fun stuff recently. It really is. And just as it takes only a bit of bad news to undo weeks of good, you can really get out of a rut by focusing on a single accomplishment. My husband takes the hard times worse than I do. He’s a man of extremes – things are “always” and “never” with him. It’s easy for him to forget the good stuff when things are really hard. I can’t say that I’m always so balanced either, but I try really, really hard to remember all the amazing progress that my son has made in the past year – how different THIS spring is from LAST spring, when things were so incredibly overwhelming. Every day, something good happens – it may be brief on the overall bad days, but there’s always something. That is a great attitude to have. The reminders of progress are all around, they’re just sometimes hard to see.